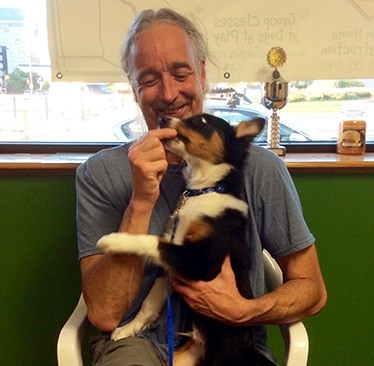 Bob Minchella offers group workshops to individuals and their canine companions. Here you will find an overview of his dog training services, workshop schedule and the ability to enroll in classes. Bob will be holding group workshops 4 days per week (Saturday-Tuesday) at Dogs at Play. Workshops are 40-50 minutes long and run for 6 weeks. Signup below or call Bob Minchella's Dog Owner Counseling at (585) 288-0780. We understand how difficult it is to schedule 6 weeks in advance into our busy lives. Can't make one of our workshops? Feel like you need extra instruction on one of your commands? No problem! Drop in during a workshop on a different day of the week. Not sure which class to enroll in? Check out the these workshop descriptions for help. All dogs must have proof of the following vaccines to attend classes: Parvo/Distemper, Bordatella, and Rabies (for dogs 4-6 months and older). Please bring a copy of your dog's vaccination records on your first day of your session. No females in heat please! *PLEASE NOTE- IF YOU PREFER TO REGISTER BY PHONE, YOUR FULL PAYMENT IS DUE 5-7 DAYS PRIOR TO YOUR CLASS SESSION START DATE OR YOUR SPOT WILL NOT BE HELD. PAYMENTS CAN BE SENT TO BOB MINCHELLA'S DOG OWNER COUNSELING, 1319 MANITOU RD, HILTON, NY 14468 THANK YOU. Time change for first week only. Your first workshop for these sessions is a lecture at 10:30 AM. No dogs! ON HIATUS UNTIL FALL 2019! Time change for first week only. Your first workshop for these sessions is a lecture at 6:30 PM. No dogs! WE HAVE WORKING SPOTS AVAILABLE FOR 8 DOGS-RESERVE YOUR SPOT SOON AS THIS IS ONE OF OUR MOST POPULAR SEMINARS! NEW THIS YEAR- WE ARE OFFERING UNLIMITED AUDIT SPOTS FOR HALF PRICE ! * DUE TO THE OFFSITE LOCATION OF THE SEMINAR, WE DO NOT OFFER REFUNDS OR MAKEUP DATES. THANK YOU. Pet lover in your life? How about giving the gift of a well trained dog! E-gift cards are now available for holidays, birthdays, or anyday for the special pets or people in your life! Available in a preset amount, or customize your own amount! PLEASE NOTE: e-gift cards are available for obedience classes only NOT private appointments. Thank you!